I like my new role as a Roadie to my son, Sam. He’s a drummer, you see, and he’s only fourteen so some of the hauling and connecting-up and screwing-together is not quite his forte yet. He can drum though. Man-oh-man, he can drum all right. So I’ve become his Roadie. Well, you know, I’m really just the Dad who hauls all the drums around and sets them up a bit. I don’t really know all than much about what I’m doing but I’m learning all the time. I'm learning about drums and I like that. Sam has a much better kit now than he used to have. That's thanks to a clever local library scheme to help budding musicians. Up until a few months ago, he had a ram-shackle starter set with a buggered cymbal and a snare that was missing some bits. Now, though, he’s got a rather fanciable Gretsch kit with Sabian Cymbals and the Roadie and him are finally starting to look the part. We’ve also got huge faux-fur-lined cases to haul all the drums around in and we cut an impressive shape when we turn up with all our gear. That’s what I think anyway. When we got that first knackered kit, one Christmas Eve years ago, it was plenty. Up until then, Sam had been going to drumming lessons without having any drums. He would tap out his rhythms on the table, on the window cill, on my head. He simply burned to drum. And that first kit was a wonderful opening-up for him. I hadn’t the first clue about it and where everything was meant to go. 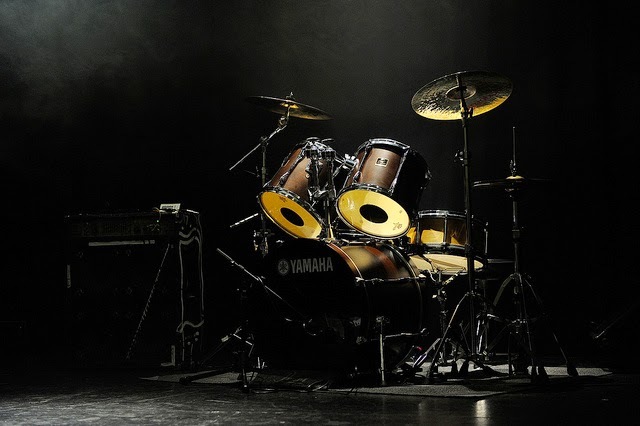 One of my abiding Christmas Eve memories will be stumbling up the hall after midnight, time and again, with the various clinking-clanking components of the drumset, trying to put it all together with nothing to go on but a jagged image printed off the internet. It was the only present he ever got where, upon its discovery, the tiniest hint of a tear appeared in his eye. And now, some years later, with the new ‘posher’ kit and some years of moving stuff around, I’ve become almost passable at packing, unpacking, setting up and adjusting everything. I’ve learned my crashes from my rides, I can set up the rather tricky high-hat in mere minutes, and I’ve stopped catching my fingers in the bass pedal thingie. Yesterday, Sam was drumming along with a professional drummer in rehearsal. The guy was really lovely and he gave me some tips for setting-up which has increased my self-image of Roadie-hood about two million percent. It’s the little things, you see. For instance, when setting up the floor tom, put it upside-down on the stool and then the legs fit into it easily. (You don’t want to know how I was doing it before). Or keep the legs of the bass drum up a bit more so that the drum is angled upward a bit at the front. It makes the pedal connect sweeter with the skin. The best tip I got yesterday, though, the absolute winner, was that the pro-drummer brings all the loose bits - the stands and such - around in a wheelie suitcase. This is so obvious but I was carting them all around loose and suffering multiple trips to the car as a result. I went straight home and got out the suitcase out and, hey presto, I am now complete. The professional drummer was also showing me some of his own kit and telling me the stories behind them. He had a beautiful snare which dated from 1968 and was found in a left-luggage locker in Chicago. The thing practically radiated long roads and old music. I feel there’s something in all that – the stories that drummers have about their drums. It's for some other day, perhaps. Tomorrow, Sam and his drum kit will travel with the Kaleidoscope Big Band to the National Concert Hall in Dublin to play on the main stage in front of the President of Ireland and loads of other people too. The Roadie is tagging along. He's checked and double checked the baggage and everything seems to be there. We’re good to go. I know nothing about drums. Next to nothing. What little I do know relates to the drums generally used in a symphony orchestra, so timpani, snare and bass. I’ve never had the slightest interest in percussion but I love listening to Evelyn Glennie enthuse about it. To be honest I could listen to the woman enthuse about just about anything. I don’t enthuse much, so I’m always curious about those who do—the life-lovers. But I digress. Our kids aren’t us. I think someone should write a checklist for parents. The dead important stuff they need to remember. After the basics—don’t starve or set on fire (the common sense ones we can usually work out on our own)—top of my list would be: Your kids aren’t you. Sometimes they make a decent stab at it—there’s no way my daughter’s not mine—but they never quite get it right. I think I’ve mentioned this before but before my daughter was born I’d already bought her a hundred books. It was so important to me that my daughter be a reader. Not to be like me. No. To be better. Because, and this is true to this day, I find reading a bit of a chore most of the time. I want to be the archetypical writer whose also a voracious reader—I used to get really wound up by Art Durkee whenever her mentioned he could read a book a day—but I’m not. The only reason I’ve managed to read a hundred books this year is because I’ve gone for short books. But I’m digressing again. It didn’t matter to me that my daughter wasn’t musical—I wanted her to appreciate music (I have a clear recollection of sticking her in front of the telly to watch a Tangerine Dream concert with me when she was only a few months old) but I never needed her to play. I would’ve loved if she had but she never showed any interest. For a while I wondered if she might become an actress but I’ve a horrible feeling I mght’ve put the kibosh on that because the first thing I did when I learned she was interested was write her a damn play. Stoopid! Stoopid! She wrote poetry for a time but never let me read hardly anything. I’ve a poem by her sitting in a frame by my bed and that’s the only one I’ve got a copy of. It’s the whole expectation thing. Can’t let Daddy down. I don’t know if she writes any more. I hope she does but then I wish everyone would and don’t understand those people who don’t. How can people get through their lives and not write? Or read if it comes to that? My daughter said to me once: “You do good guilt.” Now it’s okay to make your daughter feel guilty about not doing the dishes but it’s another thing entirely making her feel guilty about who she is or what she’s chosen to do with her life. I never got her husband. I could never see what she saw in him. He was nothing like me. Arrogant of me to expect him to be but try as I might I couldn’t get over that. She left him a few weeks back and when she told me it was so hard to bite my tongue but I did. Not met the new guy yet but he seems an improvement. The first thing I asked was: Does he read? Interesting that. She’d already told me his name and where she met him but the first thing I wanted to know was if he read. He does but not my kind of stuff. Big surprise there. At least he reads. She took two months to fill me in. Two months of radio silence. That was… uncomfortable. It was obvious when we met for lunch she was nervous. How would Dad react? Her mum, apparently, isn’t talking to her. Not surprised there but I’ll resist bitching about the ex. I did my best to be understanding. And supportive. “Do you have money? There’s money there if you need it.” What I didn’t understand (but, again, I bit my tongue) was when things went pear-shaped she didn’t arrive on my doorstep, black bags in hand; she went to a friend’s instead. But here’s the thing. She’s not my little girl any more. She’s a grown woman, perfectly capable of standing on her own two feet. Which she needs to be. I should be proud of her. I am. And, at the end of the day, that’s what’s important. I would’ve been proud if she’d wanted to play drums as a lid. Just glad she didn’t. Noisy things. Beautifully written, this, Jim. Full with heart and longing and love and stuff. I think I'll email it back to you so you have it for yourself. As you know, it's something I feel I should do with your collected comments here but time - and drums - conspire against me. I used to play drums in a band and my dad used to roadie me too. My first kit was held together with gaffer tape and I didn't even have cases for them. We, as a band, raised the money by selling bits of musical gear we could just about bear to part with. I can remember visiting a drum shop once and noting that the cost of one highhat stand was the same price I paid for the whole kit. But like your lad, I could play them. People would often look upon our meagre wares with amused scorn but we played the hell out of it. I miss it sometimes.